When I had my first child, I bought a book called, “The First 12 Months of Life,” by Frank Caplan. It outlined what a parent can expect from their baby each month. I combined the information from Caplan’s book with all of the text books from my Master’s Degree program and made a big, big chart out of butcher paper. I pinned it o n the wall in my daughter’s room. It was great to look at the chart to see where she was performing. The best part of the chart, however, was knowing what to expect and being able to watch skills emerge as she grew. For instance, a baby at 6 months should be able to pick up items with the whole hand; eg., toys, food, etc. 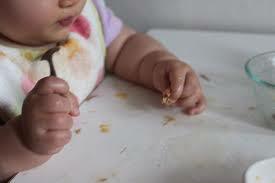 As infants develop fine motor skills, they start using the thumb and forefinger to grasp items around 7-8 months. One day she was putting Cheerios in her mouth with her whole hand and the next, she was trying to use a pincer grasp! When my second daughter came along, I continued to refer to the same chart. My second daughter, however, was having frequent ear infections and her speech development lagged behind. I was told not to worry …that she would “catch up.” Her pediatrician was great, but “old school.” I couldn’t help myself. I consulted an ENT and had P.E. tubes placed to prevent the recurrent ear infections. In no time, her speech and language skills were within normal limits. This is not a lesson in circumventing the pediatrician; rather, the importance of knowing what your child should be capable of as they develop. To give parents a similar set of resources, we started a group called Baby Talk University at Southwest Rehabilitation. It’s a free group session for parents with infants and toddler between the ages of birth and 3 years. Come to Southwest Rehabilitation and play with your baby while learning typical milestones and skills your baby should have at each month of age. In addition to learning milestones, our therapist will also provide suggestions and ways to facilitate learning. Did you know, for example, that an infant at birth can see clearly at 8-10″, which just happens to be the distance most parents hold their newborns in the crook of their arms? Did you know that a brand new baby can imitate a parent sticking out their tongue? New born babies will also turn their head left or right when they hear a parent talking to them. If you are interested in attending one of our monthly sessions, give our office a call at 541 267-5221. Learn more about what you can expect from your baby and how to facilitate learning.